Father Time In The Pool! Spring is here and the pools and beaches are open! What a blessing it is to be able to spend time with your family swimming and soaking up the sun. Of course, make sure that you protect your skin with sunblock first, but then how great does the sun feel! Teaching your kids how to swim is a must as a child. The freedom of experiencing the water without fear starts with learning how to swim. Being able to swim allows a child to overcome any fears of swimming. Being able to properly move yourself about in the water is a great accomplishment and provides the fundamentals a child needs so that they can have joy when playing in the water. Water can be a fearful experience to one who does not know how to swim. At the beach or in the pool a child should be properly taught to swim so that they can be rewarded with joy while experiencing the water. Having a pool at home is a great idea for any family. Intex has a great pool for the family. 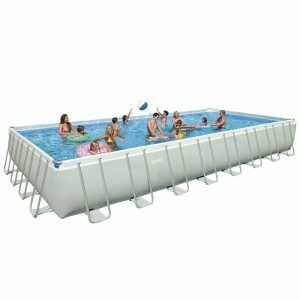 It’s the Intex 32ft X 16ft X 52in Ultra Frame Pool Set with Sand Filter Pump. This pool comes with a Saltwater System, Ladder, Ground Cloth, Pool Cover, Deluxe Maintenance Kit & Volleyball Set. Having a pool like this at your home will provide many rewarding hours of fun with the family and the neighbors. Maintenance on this pool can be challenging but it is definitely worth it as the memories made are priceless! What a great gift for father this would be! 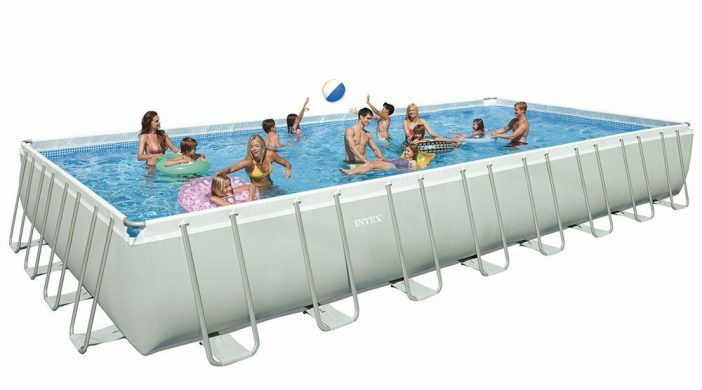 Intex above ground pool will bring you and your family lots of joy. Making sure everyone knows how to swim will keep you all protected. This along with proper rules and flotation devices and no horse playing. Making sure to respect the pool with safety is of the utmost importance!